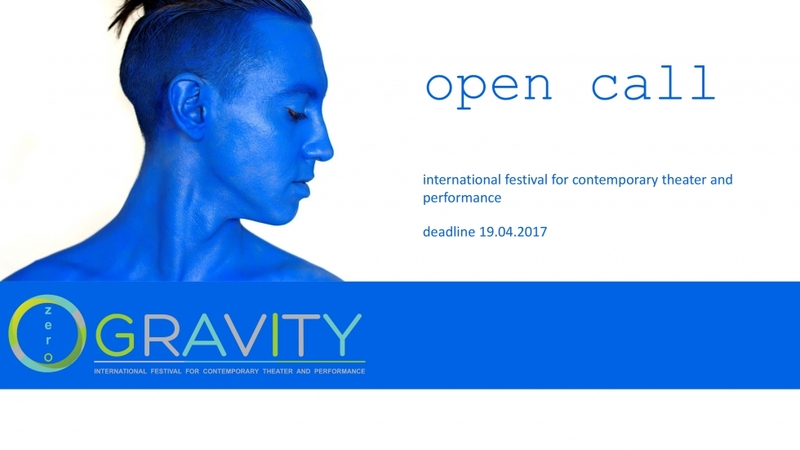 International Festival for Contemporary Theater and Performance “Zero gravity” is calling for theatrical and dance companies and groups for participating in the festival - theatrical, attendant program and artistic workshops. We are pleased to inform you that International festival for contemporary theatre and performance /IFCTP/ “Zero gravity” Knezha 2017, organized in the last nine years as NIATF ”Zvezden prah” by NCC “Borba1896” with the exclusive cooperation of the Ministry of Culture, “PLEVEN’S SOCIAL FUND – CULTURE CENTERS”, “Artist” Foundation, Town’s Institute Foundation, BAROQUE, YBSSTI and “America for Bulgaria” Foundation, included in the National cultural calendar of MC, full-pledged member or BFA, with major media partner – Bulgarian National Television /BNT/ organizes its First edition as a new festival concept. IFCTP “Zero gravity” has no competetive character, the goal is to present a diversity of spectacles, models and different tendencies of the contemporary theater and performance, to encourage the meetings and cultural exchange between theatrical and dance formations, artists and their organizations, to provide a free cultural space, which stimulates the development of the contemporary forms of art. In this regard the Organizing committee provides a prize in the amount of 1000 BGN for stimulating development. The theatrical program is divided in three modules – contemporary dance, performance and interdisciplinary theatrical forms. The artistic workshops aim to prepare a finished artistic product, a result of the colaboration between mentors and participants in the festival. The team of mentors is compound by approved specialists in the respective field from the country and abroad. The participants receive a graduate course certificate. The attendant and the festival programs are conducted in parallel and include a selection of innovative cultural events and processes. A participation of all age groups is allowed. Each group presents a spectacle with a predominate non-verbal part /motion, dance theater, shadow theater, pantomime, experimental scene forms/up to sixty minute /excluding forms are only approved by the Organizing committee/. A team of mentors, experts in the field of contemporary art, supports the work of the participants through professional advices, conducting discussions, preparing a detailed analysis of the work of directors, actors, dancers and scenographers. If needed the organizers cover the technical maintenance of the groups and the basic equipment of the stage. You will receive an application after the selective session.